Originating from Thailand, Pad Thai is a stir-fried rice noodle dish commonly served as a street food and at most restaurants in Thailand. 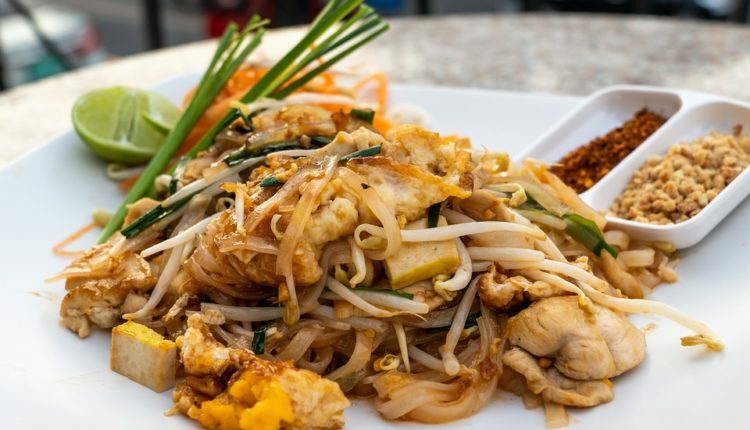 In 2011, according to a reader’s poll conducted by CNN Go, Pad Thai was listed as number five on a list of “World’s 50 Most Delicious Foods”. This is such as delicious recipe! While it’s not particularly low in fat (it has about 11 grams of fat per serving), the fat in this recipe contains no animal fat. And, if your natural or organic peanut butter, it contains no hydrogenated fat either. The lack of animal products or animal byproducts makes this recipe vegan as well. 2 cups of mixed vegetables, steamed, microwaved or stir-fried. Prepare rice noodles, drain and set aside. Squeeze tofu completely dry. Cut tofu in 1/4″ to 1/2″ squares and set aside. Mix peanut butter, sugar, soy sauce, lime juice, and red pepper flakes. Set aside. In wok, stir fry garlic and tofu in 1 T oil until lightly browned. Add remaining oil, onions, and optional ginger stir fry two minutes. Add vegetables, water if needed, stir fry one minute. Add peanut mixture, bean sprouts, and noodles. Stir fry until all is hot and sauce thickens. Garnish with optional sliced lemons.